How cute are these ice cream cone cookies! 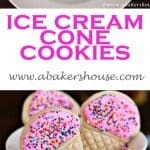 An ice cream party is a great way to celebrate the start of summer…and these sweet cookies are perfect for the occasion. They don’t melt, they are easy to make ahead of time and they are adorable. Make them as party favors, class treats at school, or for a picnic dessert. These cookies will be quickly gobbled up, leaving barely a crumb but plenty of smiles behind. I baked these with my favorite recipes from Bridget from Bake at 350. 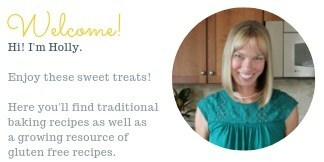 Buy her book– it is excellent if you want to get started making and decorating cut out cookies. I am stuck on her first recipe for this basic sugar cookie and must move on to try other flavors but this recipe works so well for me that I haven’t gotten around to switching up the flavors. I found this ice cream cone cookie cutter in a box of cookie cutters that I bought from Target ages ago. I wondered if the pattern on the cone would survive after baking and it did. I think freezing the cookies for 10-15 minutes before baking really helps the cookies keep their shape. Add some royal icing colored in pink (or any fun shade for that matter), cover with sprinkles and you have this cute treat. It is true…I scream, you scream, we all scream for ice cream (cookies!)!!! I love making decorated cookies like these high heel cookies, hummingbird cookies, and graduation cookies. Baking for others makes it such fun for celebrations! Do you have a birthday celebration coming up? Well these ice cream cone cookies would be perfect! So would cake cones— a combination of cake and ice cream. These are great cookies Holly, I love them! The colours are so vibrant and I love the sprinkle. Thanks, Laura, these were fun to make!